Above figure: Schematic process for separation of DNA at a stretch. DNA separation by size is the foundation of biotechnology for DNA sequencing, manipulation, and bioinformatics analysis. 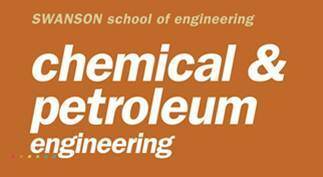 Motivated by the broad applications of DNA separation, we have been developing a novel DNA separation method which is fundamentally different from classical gel and capillary electrophoresis. Our method is based on first tethering the DNA molecule to a solid surface through precise end-hybridization and then sequentially pulling the DNA off the surface under an electric field. The anchor is such designed that the critical force to detach a DNA chain is independent of the chain length. Because the electrical force is proportional to the DNA net charge, a gradual increase of the electric field leads to size-based selection of the DNA strands—longer DNA molecules depart the surface first followed by the shorter ones. This separation strategy may provide a convenient, low-cost, and high-speed alternative to existing methods for DNA separation, because it does not require separation matrices such as gel or polymer solutions and, in principle, there is no upper limit on the length of the DNA that can be efficiently separated. By using this method, we have been able to separate lambda DNA (48,502 base pairs) from human genomic DNA (> 100,000 base pairs), as well as to separate short single-stranded DNA (in the range of 60-90 nt) with a 10-base resolution. The above figure presents the schematic process flow for separation of lambda DNA (48,502 bp) from human genomic DNA (> 100,000 bp). (a) A poly-A tail is added to the 3’ end of the dsDNA molecules using a terminal transferase, and a poly-T probe is immobilized on the surface of a glass slide by covalently linking the amine-modified 3’ end. (b) The dsDNA molecules with the poly-A tail are hybridized with the poly-T probe. (c) When a DC electric field (E) is applied, the DNA molecules are loaded with a stretching force (Fs) that is proportional to the length of the DNA. When the force exceeds a critical value, the poly-A tail unzips from the poly-T probe and the dsDNA molecules are detached from the substrate. Because the longer DNA is loaded with greater stretching force than the shorter one under the same electric field, the longer one is detached earlier than the shorter one when the strength of E is gradually increased. (d) After the strength of E is further increased, the shorter DNA is also detached from the substrate, but separately from the long DNA. The figure below presents the results: fluorescence signals detected from the glass slide with immobilized DNA mixtures consisting of lambda DNA (labeled with fluorophore Alexa 488) and human genomic DNA (labeled with fluorophore Alexa 568). (a-h) Fluorescence images taken after a (a) 0, (b) 25, (c) 50, (d) 75, (e) 100, (f) 200, (g) 300, and (h) 400 mV DC voltage is applied, respectively. The scale bars are 300 µm. 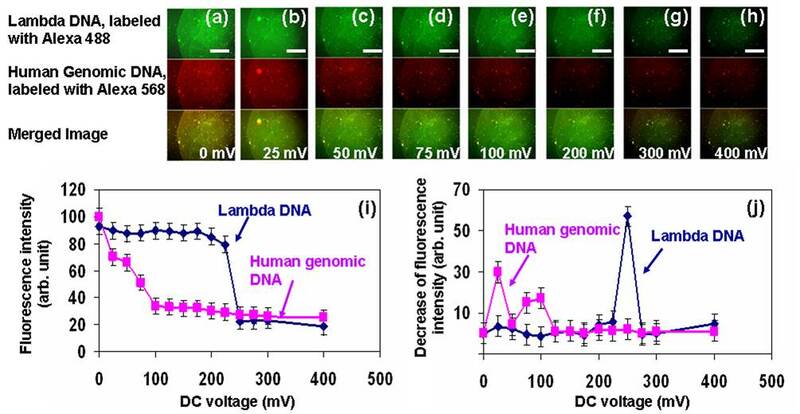 (i) Fluorescence intensities detected from lambda DNA and human genomic DNA as a function of the applied DC voltage. (j) Decrease of the fluorescence intensity corresponding to the amount of DNA detached from the substrate when the DC voltage is increased step-wise. It is challenging to conduct experiments for separation of short DNA strands by employing the same experimental setup, e.g. a chamber made by sandwiching an insulating membrane between two conducting plates, that we have used for separation of long DNA molecules. This is because a large electric field (in the order of 105 V/m) is needed to load the short DNA strand with a large enough stretching force to pull the DNA off the substrate and this large electric field may cause various problems such as Joule heating and side electrochemical reactions. 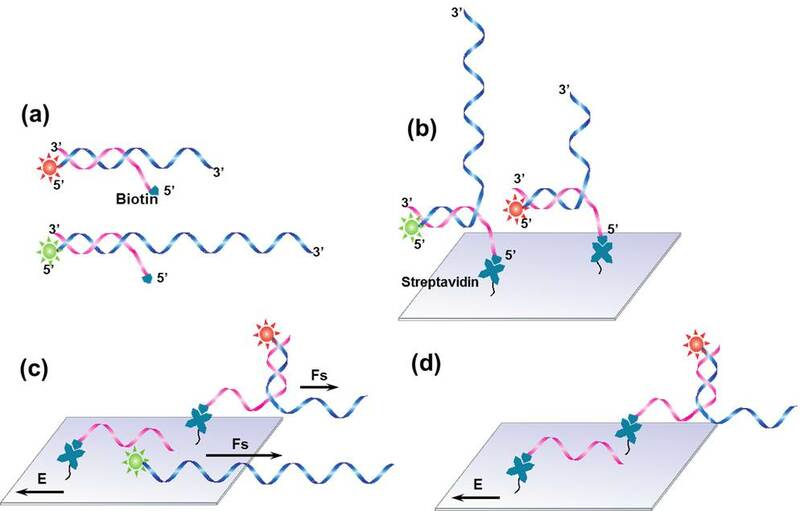 By employing a microfluidic platform with narrow channels (see figure below) filled with a low conductivity buffer, we are able to apply a high-strength electric field to pull short single-stranded DNA (ssDNA) off the surface while reducing the Joule heating in the buffer. By increasing the electric field strength in a staircase waveform, efficient separation of short ssDNA molecules (in the range of 60-90 nt) with a 10-base resolution has been demonstrated. Above figure: Microfluidic channels for separation of short ssDNA. (a) Schematic top and side views of the microfluidic device. The microchannel is 50 µm wide and 35 µm deep. (b) The DC potential in a staircase waveform applied to the microchannel. (c) Simulated electric field profiles in the microchannel (with a potential drop of 100 V). A uniform electric field is obtained in the middle region of the channel. Above figure: (a) Normalized fluorescence intensities (α) obtained from the 90-nt, 80-nt, 70-nt and 60-nt ssDNA fragments as a function of the electric field strength (E). (b) Negative derivatives of α (which correspond to the amount of ssDNA detached from the surface) as a function of E.